I think we’re going to keep it simple this week. I don’t typically do set reviews because I like to wait until the dust settles but this week I don’t really have a topic I am burning to talk about and I figured it’s worth just talking about the stuff in M19 that I expect to impact EDH and therefore be financially relevant for readers like you who are, I hope, adherents of my system. Adherents to? People who use my method. Here’s what I think matters and why. Nicol Bolas is easily the best Nicol Bolas ever. Easy to cast, makes an immediate impact and flips into a really brutal planeswalker. 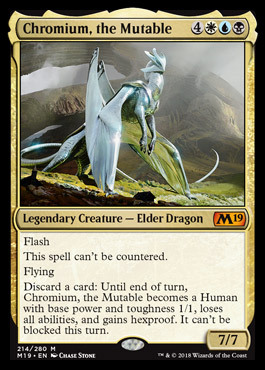 I think that not only will we see new Nicol Bolas decks pop up on the basis of this card, we’ll see people dust off their old Nicol Bolas decks. 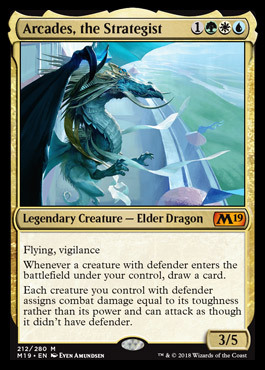 This is better at the helm than any other Nicol Bolas ever because it’s easy to rebuy with commander tax whereas an 8 mana Bolas really isn’t, especially in Grixis colors, which historically don’t ramp well. I think the increased popularity of Nicol Bolas decks, probably with new Bolas at the helm and Legends Bolas relegated to the 99, will put some non-zero amount of pressure on Bolas staples. There are some cards that have some upside already and this will only push them over the edge. This card really grew. I’ve been watching it and I think this could get to $8 pretty easily within a year if it’s not reprinted, which would be pretty tricky. Torment is used in a lot of decks ranging from Kess to Scarab God to Gitrog Monster so upside from Bolas isn’t the only thing buoying this card but it certainly won’t hurt. Check out the page for other Bolas staples you think have some upside since I’m not doing a deep dive on Bolas per se. That nearly 12,000 decks figure it a lot more meaningful when you consider that it was an $80 card at one point. If buylist gets to like $11 or $12 on these I am going to get real aggressive and go in on these. It will be a long time before they’re $80 again, if ever, but they won’t be $20 for long. This is an example of “discovered demand” which is a term I’m inventing. The mere act of reprinting a card that was priced out of the realm of possibility for people creates more demand because it’s now affordable enough to put into decks, now. This will help the price recover faster since the demand is now higher. Add to that how aggressive I will be about snatching these up because this is a $40 card in a year and you have a recipe for a great financial opportunity when supply peaks. The one knock against this card is that it’s not a huge power player in anything recent. That said, it wouldn’t take much for a new card to be printed that put lands in the yard. I think Tatyova decks could make great use of Crucible a lot more than they are – if you’re enabling yourself to play 4 extra lands in a turn, which is better; playing a few basics or playing a Strip Mine out of your yard 5 times? I rest my case. Crucible is playable in a lot of formats and I don’t think its price is mostly predicated on scarcity. Real demand exists and new demand is about to be created. Underestimate this card at your peril. This card already got its own entire article but I think it’s worth mentioning that there are already decklists out there if you know where to look. They aren’t aggregated yet which will help a lot, but you can get a jump on paying attention, although I covered everything I think matters until we get more data. I expect this to be the number one M19 deck built for a while if not forever and whether or not you like it, that’s probably the case. I think M19 has better choices but I learned long ago what I think affects prices less than what everyone thinks. This isn’t in quite as many decks as Crucible, because it’s not an artifact for one, but I think it has as much Legacy demand and I think discovered demand could be a factor here as well. I expect prices to recover as people who weren’t enfranchised before can get a cheap copy in a trade or bust one in a pack, something that wasn’t possible before. I think this is sneakily one of the best cards in the set. I listened to the EDHRECast so you don’t have to (but you should) and they seemed a little baffled by this card. I’m not baffled at all – this is going to murder people very quickly and easily. The 6 power you lose transmuting Chromium into an unstoppable murder machine will be mitigated by stuff like Battle Mastery and Swords. You’re going to 1-hit KO people with this card and they won’t be able to stop you. Zur may be a “better” deck but that perception is waning a bit. I still like that Zur can grab Necropotence but if you’re trying to go Voltron, this is legit. I am not sure what to put in the deck, but I’ll do a deep dive on it if the data supports that necessity. Chaos Wand can cast every instant and sorcery in their deck with Paradox Engine and a few mana rocks. I am going to do that in every deck I currently have that runs Paradox Engine. It’s been a minute since we looked at Engine and this is as good a time as any. It’s been months since I said that this was a pretty good buy at $10 because the only way you lose is if this is banned (it wasn’t) it got reprinted (I can’t imagine it will be soon) or it gets cheaper for some reason (its price doubled). I don’t know if I like this as a buy at $20 as much as I did at $10 and this hasn’t rotated out of Standard yet so I’m going to watch to see if it dips at all then, but my gut tells me this is a $25-$30 card in a year and I don’t think it is fair enough to jam in an EDH precon, the right flavor for a Core Set or broken enough to ban. This is powerful but it’s also fragile, expensive and depends on a board of mana rocks to do anything. I think it’s absurdly good but I don’t think it’s bannable since its power comes from synergy. 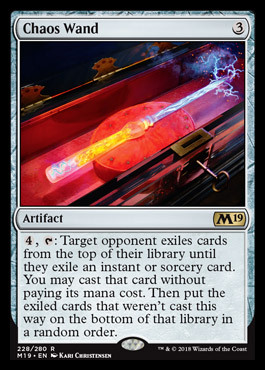 I still like buyback spells with Engine a lot and using Reiterate to untap all of your mana rocks and double the spells you’re getting yourself until you can find your Chaos Wand seems fun. I don’t think Chaos Wand’s price will matter but if someone plays Wand with Engine on Game Knights or something, a lot of stuff will pop off. If you’re not watching Game Knights, you should if you care about being 24 hours ahead of a run on stuff like Shadowborn Apostle and you may even want to become a Patron to be 48 hours ahead. This card is absolutely insane in EDH. Lords are good, but usually Lords are like “All elves get +1/+1 and Snow-Covered Wasteswalk.” Turning a pile of Krenko tokens into murdering their entire board is insane. If this were Legendary, it would be bannable. Artifacts are incredibly important in this format. True, basically only Krenko decks will run this and maybe a few others, but this is going to be really tough to beat. Let’s look at some decks I bet it impacts. Since I’m in a teaching mood, I’ll share my thought process for how I’ll go about finding which decks this likely goes in. 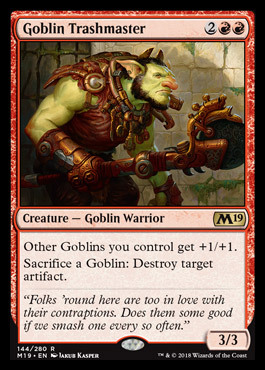 Krenko is obvious because it is the goblin token producer extraordinaire but there have to be other commanders that this card pairs well with. I’ll look at Krenko first. Not the most popular commander and not the least. But hang on. this menu makes me think of something. If Krenko isn’t the commander, it might still be useful in the 99 of any goblin deck. If I view as a card, it will tell me which other commanders would use Krenko. And just like that, we have 8 examples of decks that run Krenko. It doesn’t mean Trashmaster will get played in all of these decks, but I think there is a good case for correlation. Any deck with Trashmaster will want Krenko even if it’s not the other way around. Wort seems like an excellent home for Trashmaster and it only took a few seconds playing with EDHREC to find a bunch of potential homes for Trashmaster. It’s a good resource and I don’t get paid for pageviews so I don’t care if you use the site or not but you should. With the resurgence in popularity of Shadowborn Apostle decks because of Game Knights and the resurgence in ripple decks in general with the printing of Rat Colony, I think the ripple infrastructure deserves another look. It’s probably about to really pop and if a win condition like this makes Apostle (because you tutor for demons) more attractive than Rat Colony, people could build both decks (probably not) or build the older Shadowborn Apostle build which has upside if there are older cards in it. Although the ship has probably sailed. Here is the graph of Thrumming Stone from the article I wrote in April. Hope you got your copies in April. This splits the “ripple” vote a bit since demons don’t synergize with the rats at all, but Shadowborn Apostle builds will want this card and that’s good enough for some extra demand if people don’t have the deck built yet. A $23 stone isn’t a huge impediment to a deck with 40 copies of a $4 apostle but maybe a $45 stone would be. I still don’t hate it at its post-first-spike price but I really hope you listened back in April. Anyway, I’ll dive deeper on individual cards and their implications when I have a little data to back it up with, probably next week. In the mean time, go into the prerelease thinking about which cards in M19 could spawn decks, what go in those decks and prioritize cards like Scapeshift, Omniscience and Crucible that will be good forever over stuff like Resplendent Angel that may or may not be good ever and are super hyped right now. Until next time!